Whether you’ve built a business around photography, or you’re looking to make killer home movies, a drone can take your art to the next level. We researched and reviewed the best drones for filming and photography to bring you a top ten list of superior models on the market. Before you start shopping, check out the following specifications that can help guide your purchase. Range: Check this spec for information on how far and high your drone can fly. Depending on the pictures you plan to take, you may need a drone with a wide range. 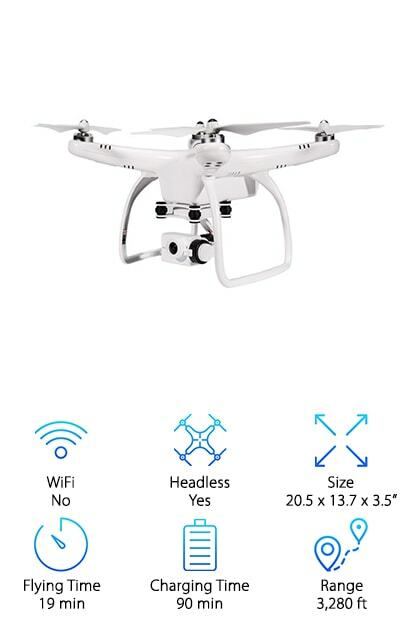 WiFi: If you’re searching for high end drones with camera equipment, you may also want WiFi. It allows you to live stream footage or control movements from an app on your phone or tablet. Flying Time: When you’re on the hunt for the best drone for photography, flight time is an important spec to consider. Make sure the drone you choose will be in the air long enough to get great shots. Charging Time: You’re excited to get great footage with your new drone, but how long between sessions will it take to recharge? Check this spec for the details. Headless Mode: Headless mode helps beginners learn to fly and keep their drones steady. 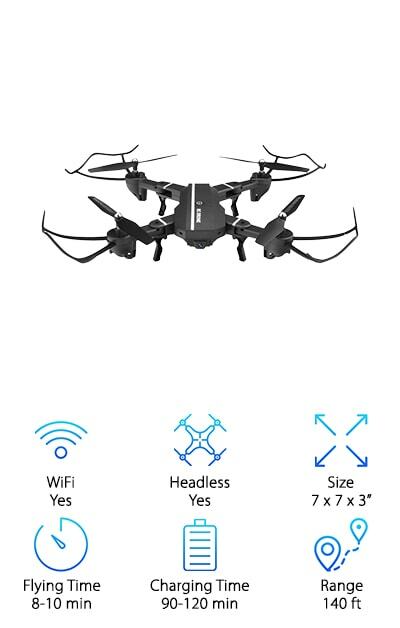 If this is your first experience with professional drones for filming, headless mode is an ideal option. You’re up-to-date on all the specifications to look for while shopping and ready to check out our drone buying guide. We think you’ll enjoy going through the list because every drone is a top-quality model that stood out from the competition and was carefully selected. If you’re in a hurry, check out our top and budget picks first, then continue onto the other eight models for even more excellent options. Let’s get shopping! Our top pick, the DJI Phantom Professional Drone is a drone with 4K camera capabilities, a short charging time, and a long flight time. Packed with impressive features, the Phantom is sure to please even the toughest critic. It is equipped with a high-tech vision positioning system that allows you to fly indoors, so you get all the best shots, whether inside or outside. The 4K high definition video recording and 720p digital streaming ensure crystal clear pictures and videos perfect that clients or friends and family will love. The full resolution videos and pictures are simultaneously recorded on an internal microSD card, for future reference. And get this: the flight range of the DJI is over a mile! It uses a fully stabilized 3-axis gimbal to maneuver and is capable of 20 minute flights, giving you ample time to photograph or record scenery or events. A downloaded app allows live streaming and complete camera control from your phone or tablet, too, so you can operate this drone from a device you’re already comfortable using. Say hello to our budget pick, the DJI Spark. This mini drone is small enough to take with you anywhere but produces larger than life pictures and video. Not all commercial drones for sale are big or expensive, and the DJI is the perfect testament to that. This little superstar is equipped with a powerful 2.6 wide-angle lens with a 25 equivalent focal point. A 2-axis mechanical gimbal and UltraSmooth technology reduce shaking and rolling to keep the drone stable, so each shot is crystal clear. Charging time is just 45 minutes and allows you approximately fifteen minutes of flight time. The quick charge is optimal for anyone who wants to use the drone for all-day photoshoots or who has a lot of land to cover. By the time you’re done setting up your next scene, the drone is ready to go again! Best of all, the DJI is super affordable. You don’t have to break the bank to take advantage of the edge drone photography can bring to your work. Wow, your clients with amazing footage when you use the Yuneec Pro drone. This professional RC drone with camera comes loaded with special features and accessories. Its stellar capabilities and high-quality camera make it our pick for the best drone for videography. The Yuneec is capable of taking stunning video and pictures with a 4k ultra high definition camera and full 360-degree anti-vibration gimbal. 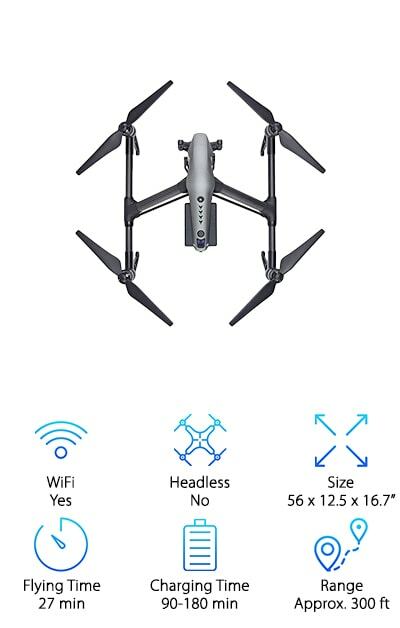 The retractable landing gear is ideal for 360-degree filming, and get this: this drone features a team mode, so one can film while another flies. What does this all mean? It means this drone is equipped with one of the best cameras on the market and it has the technology to produce an extremely steady flight. Your videos will feel like real time, every time. 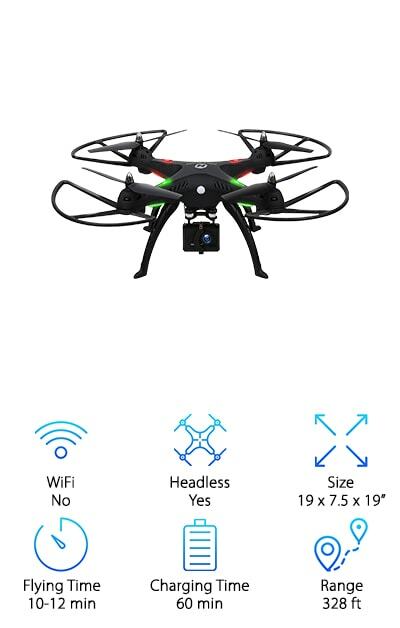 Worth every penny, this pro drone comes with an all-in-one controller, integrated seven inch Android touchscreen, Wizard, backpack, and extra battery. It is equipped with a built-in ultrasound technology that helps it navigate and avoid collisions, too, so even beginners can take it for a spin! Shoot high quality images on a budget with the Holy Stone HS300 Quadcopter. Equipped with a professional 1080P, 120-degree, wide-angle, high definition camera, you’ll be able to record stunning video and take clear pictures from above. If you’re looking for the best drone for real estate photography or landscape photo shoots, you won’t want to miss out on this durable, heavy-duty model that can handle high volume in a variety of environments. Impress everyone with professional, crystal clear footage and pictures. The best part? You don’t have to be a professional to take this drone for a spin. Beginners can easily master flying the Holy Stone. It’s equipped with automatic altitude hold, one-key return, speed control, emergency stop, and headless mode. And get this: it features LED lights for night flying, so you can get awesome evening and night photos, too! Whether your usual work is filming weddings or you’re looking for the best camera for real estate photography, everyone searching for camera drones wants a quality device capable of getting great pictures and video. The UPair Aerial Photography Drone is equipped with a 2.7K camera in 1080P high definition, so you’ll get the perfect shots for your clients or your own Website and social media. 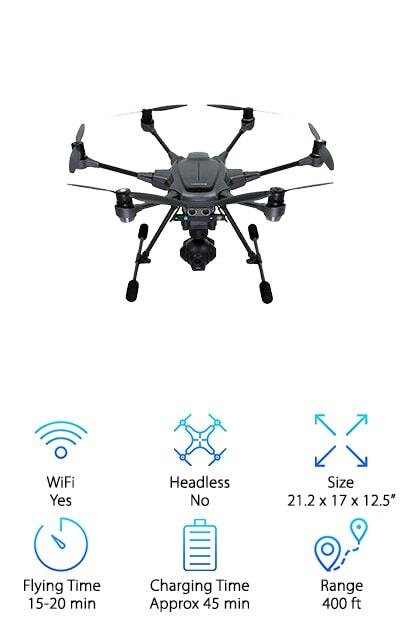 Catch all the best angles with this exceptional drone with HD camera output that blows the competition out of the water. Flying is also a pleasant experience. 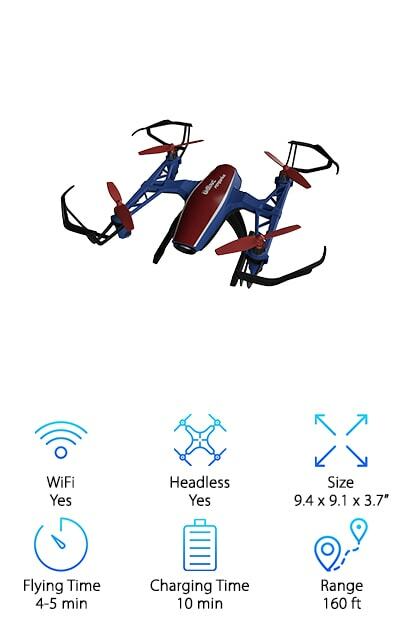 This drone features position hold mode, headless mode, altitude hold mode, one-key return home, low-voltage return home, and lost contact return home functions. The intelligent Li-Po battery takes 90 minutes to charge and affords you approximately 19 minutes of flight time. You can also enjoy a live feed, thanks to the included screen that doubles as a controller. Packed with superior features, the UPair is the ideal pick for professionals. Looking for the best drone for commercial use? Check out the Contixo F17 Photography Drone. 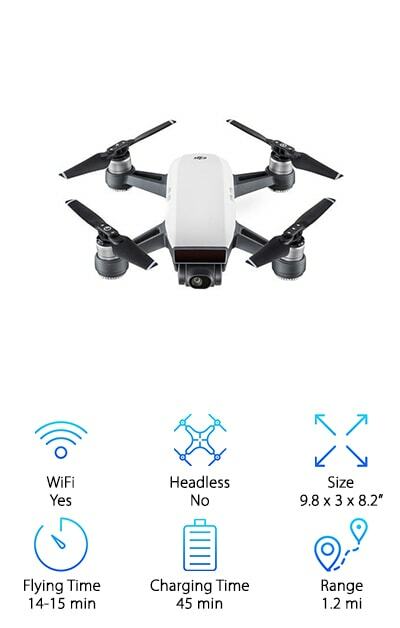 Equipped with a 4K ultra high definition camera, this drone can also support a GoPro and connect to your smartphone, too. 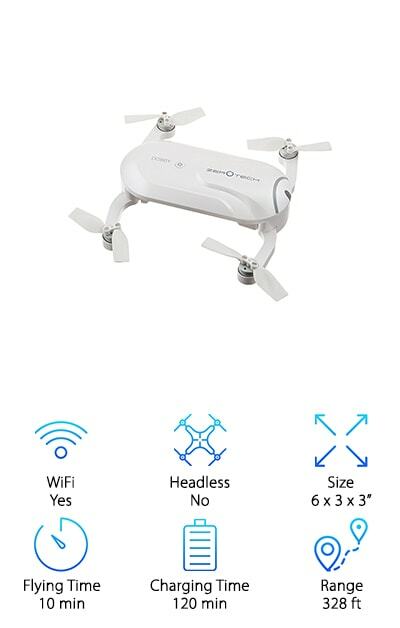 That’s three different ways for you to capture stunning photos and videos in high definition quality, making this model an easy pick for the best drone for video recording. Even better? You can remove the action camera and use it without the drone! How cool is that? If you want to get a shot closer to the ground, simply remove the camera and take it yourself manually. We can’t think of a single photographer who wouldn’t appreciate being able to manually use the included high definition camera! When it comes to filming while flying, you’ll get clear images and enjoy steady, long-lasting flights. The F17+ is equipped with brushless motors that reduce friction between motor parts and in turn prolong battery life compared to conventional motors. Speaking of the battery, this model features a high capacity battery that allows flights of up to 18 minutes. If you’re looking for industrial drones for sale and you want it all, we have good news, because the next drone on our list comes as a bundle package loaded with exceptional features. The DJI Inspire 2 Quadcopter is a top-rated drone with a professional camera and a variety of convenient accessories. Definitely a contender for the best drone for aerial photography on our list, this quadcopter yields cinema-grade pictures and videos and features patented CineCore 2.0 image processing for professional shots. Easily impress anyone who sees the quality images you’ll achieve with this professional drone. Record high resolution footage at speeds up to 67 miles per hour. That’s great for anyone who wants to film sports or action events. The cool part? This drone is equipped with sensors that both help it focus on a target for recording and work to avoid collision. With 27 minutes of flight time, you won’t miss a thing, but if you do, it doesn’t take long to recharge the batteries. Get great shot after great shot with the Force1 Mini HD Camera Drone! Perfect for beginners, this drone is equipped with headless mode, one-key takeoff and landing, and altitude hold. The 6-axis gyro keep it steady as it snaps pics and videos. Live stream the action straight to your smartphone or tablet, thanks to the Force1’s WiFi capability, or save it for later. If you’ve never flown a drone before, and you want to get started with a durable, affordable model equipped with a decent camera and micro SD card, then the Force1 is a great option. It will meet all your needs while helping you learn to navigate the skies and recording awesome imagery. When you download the compatible app, you can control the drone right from your phone! Although fun to fly, you’re here for the photography, so it’s worth noting that this drone features a 720P high definition camera, ensuring your subjects shine through in perfect resolution. You’re on the hunt for the best drones with camera for sale online. Depending on your plans, you might appreciate a miniature model that can easily be transported wherever you want to take pictures or shoot video. 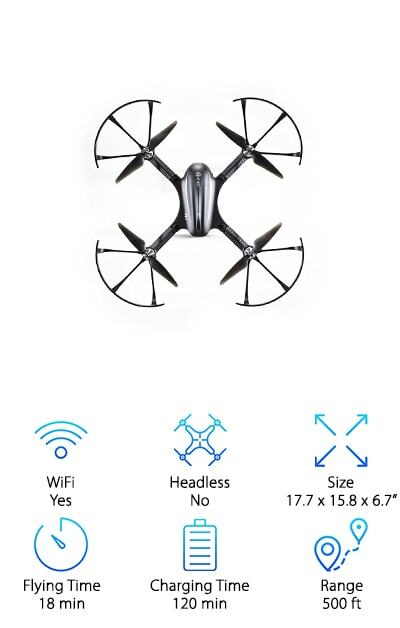 The ZEROTECH is a compact drone equipped with WiFi transmission and compatible with your favorite electronic devices, including tablets and smartphones. When you choose ZEROTECH, all you’ll need is this tiny drone, which fits in your pocket, and your phone. Download the compatible app and control the drone with your fingertips. You’ll be making stellar movies and taking crystal clear pictures in no time and with little effort! Get all the best shots, thanks to object tracking and facial tracking capabilities. If you’re in the market for the best drone for real estate photography, but don’t want to lug a ton of equipment to each property, then this is the ideal product for you. You’ll get quality shots of your listings with zero hassle. Rounding out our top ten list is a smartphone-compatible option at a crazy affordable price. Since you’re already comfortable doing virtually anything from your phone, why not check out the best drones for filming and taking pictures via smartphone controls? The VISUO drone is a WiFi-connected drone that syncs up with your phone or tablet to get the perfect in-flight pictures and videos. We combed through every camera drone review of some of the top-rated models, and when we stumbled upon the VISUO, we knew we had to include it on our list. It allows you to view live footage from the world above, right to your favorite device. Take advantage of the 720P high definition camera to snap the perfect pictures. And the air pressure altitude hold function will keep the drone hovering at just the right height for ideal shots. Equipped with one-click launch, one-click landing, one-key return, and headless mode, this professional drone is easy to fly and ideal for beginners. If you’re trying to find a cheap option that delivers stellar shots, then look no further.